My basic advice: scripts start with an idea, then a logline, then a 200-word version to test if the story fits into the three act structure. The next step between the test and the outline/treatment is a list of roughly 40 beats. That’s not a hard number, some scripts go 30 beats, some go 50, but 40 is a nice approximation. A beat is major event in the story that makes fundamental changes to the world of the story. “Bob and Joe fight and end their partnership” is a beat. “Bob gets off the plane” is not, unless Bob is Mr. Bean. A good rule of thumb is to ask yourself if your beat could plausibly take up 1/40th of a script (three pages). If it can’t, it’s not a beat. 40 beats on a screenplay I wrote. Your list can take any number of forms. An excel spreadsheet, cards on a corkboard, post-its on a bedroom mirror, pen and ink. It doesn’t matter, they’re all different ways expressing the same idea. For added cogency, try expressing the high concept of the beat in 7 words. 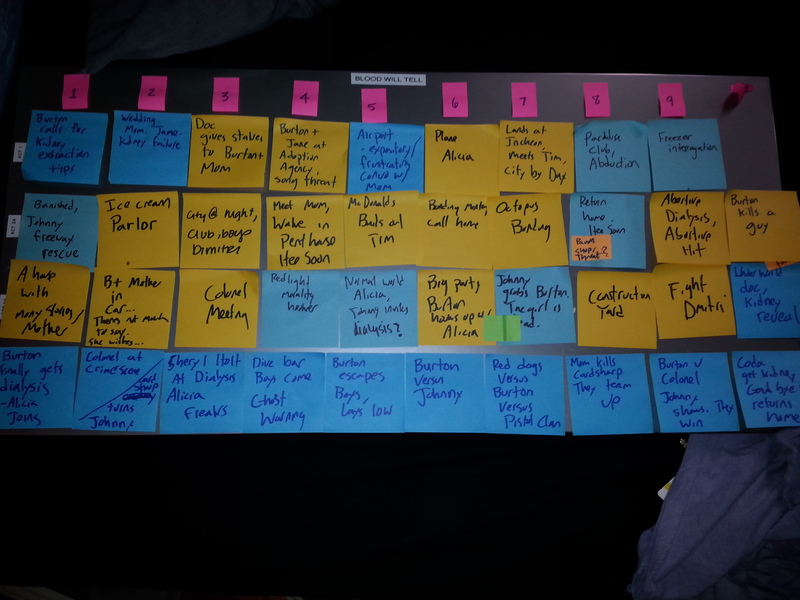 John August prefers scene cards to a straight up list. So you need 40 beats of seven words a piece. That’s 280 words, barely a page. Easy! Get them done, and rush to the outline. You’re a natural, you screenwriting prodigy, you! No, seriously, this should be hard. You need to force yourself. Grind out a list of 40, then grind out another version of the list. Do this often, at many different steps of the process. Always be looking to improve what you’ve got. The possibilities are endless. It doesn’t matter how you do them, so long as you do them. * Note – this is a revised version of an earlier article.